Now that the Hogwarts Mystery role-play app is available from Google Play and iTunes, Harry Potter fans around the world have the chance to enrol at the famous school for witches and wizards, where they’ll meet Zoë’s Madam Hooch herself. If you’re as sharp-eyed as she is, you’ll first spot the formidable games mistress in the spectacular Great Hall, shortly before being ‘sorted’ into your Hogwarts house. After a spot of wand-waving, brewing potions and (of course!) a near-death experience, the time has come to attend the first years’ first flying lesson. Hogwarts Mystery’s designers have created an engaging, impressive virtual world. 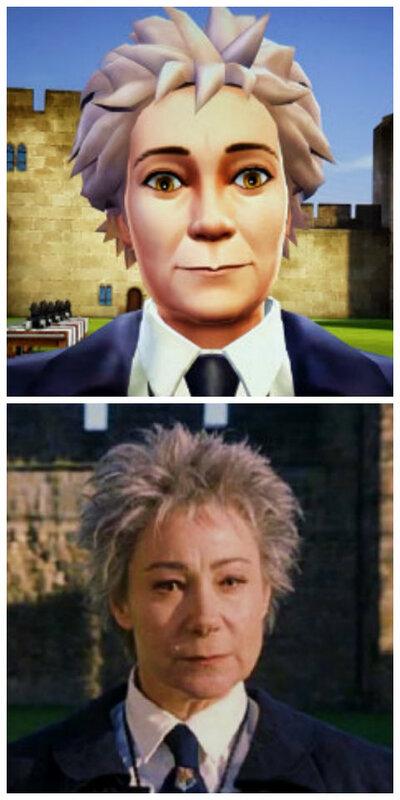 I think that Madam Hooch looks almost as tough, eagle-like and spiky-haired here as Zoë does when portraying the character in the first Harry Potter film (the bird-of-prey eyes are a particularly good match). ‘Virtual’ Hooch is similarly adept at flying a broomstick, too. Much of the dialogue in the app appears as text on screen rather than being spoken aloud (‘Do not lean too far to one side or you will surely fall to your death’ is one piece of advice from the flying instructor that Hogwarts students won’t forget in a hurry! ), but you’ll hear Zoë’s distinctive voice from time to time. And look out for the invitation to discuss Hooch’s hair – well, it is rather magnificent! 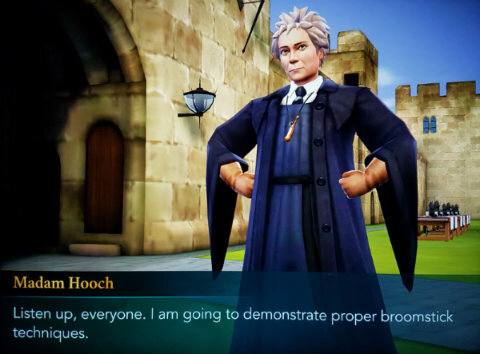 My knowledge of the Harry Potter novels and films is far from encyclopaedic, but I had no trouble immersing myself in Hogwarts Mystery. So, whether you’re a self-proclaimed Potterhead or life at Hogwarts really is a mystery to you, I’d say give this new app a try and see if you can impress Madam Hooch with your flying skills.